Edgar Allan Poe has always fascinated me. I love his work, as his poems and short stories have always struck me as the perfect level of macabre and creepy. I wrote a discussion post a few months back about if novels should be adapted into graphic novels once the author can no longer give their go ahead. But Poe’s works are now in the public domain so many feel his work is fair game, with some adaptations having greater success than others. Hinds, Gareth & Edgar Allen Poe. 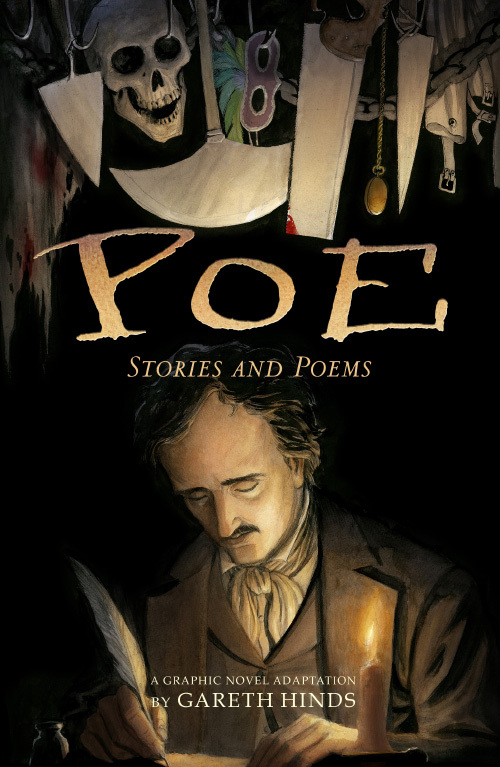 Poe: Stories and Poems. 2017. I have been looking forward to this adaptation by Gareth Hinds that recently came out, for his previous adaptions of classics such as Beowolf, Macbeth and The Odyssey have received rave reviews. I was not disappointed, although I didn’t feel it was a home run either. The Masque of the Red Death– Using vivid imagery, this story incorporates the theme of “death comes for us all” quite effectively. The Cask of Amontillado– Revenge most sweet. Fortunato insulted Montresor one too many times, and his own vanity led to his demise with no guilt from Montresor. I have to admit this story appealed to me, for don’t we all at times wish revenge on those that have wronged us? Annabel Lee– My favorite of Poe’s works, hands down. The poem of lost love and eternal devotion has always appealed to me. I didn’t care for the illustrations for this poem initially, but his interpretation of sacrifice and years going by grew on me. The Pit and the Pendulum– Hind’s illustrations were evocative of the fear of the unknown as the prisoner awakes in a jail cell, in which he is tortured by unseen guards and has to use cunning to escape. The Tell-Tale Heart– An interesting retelling of the tale of a guilty conscience, Hines frames the confession coming from an inmate in an insane asylum. The Bells– I was not familiar with this poem, but the imagery Hines paired with the stanzas helped build the rhythm, and truly made the bell chimes seem real in your ears. The Raven– Another of Poe’s stories that lament lost love, Hinds makes the choice to make the narrator look like Poe to great effect. This story’s illustrations were my favorite, and he incorporated little visuals from the other stories into this tale. The classical motifs were represented and the raven aptly symbolized the narrator’s grief and his descent into madness. The illustration style skews young, where I almost felt I should place it in the Juvenile collection at my library, did it not have such dark themes of murder and violence. 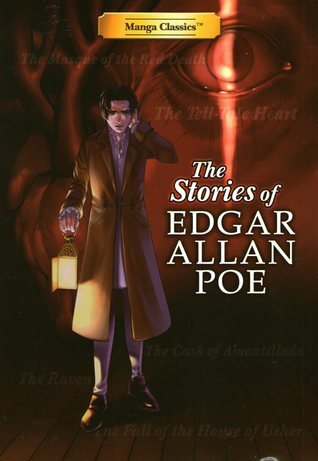 I feel that this is a strong adaptation, and with the author’s notes about Poe and his stories, it is an excellent introduction for younger readers to then make the choice to study Poe’s additional works. King, Stacy & Edgar Allan Poe. The Stories of Edgar Allen Poe, 2017. I am typically not a fan of Manga books, but I was intrigued to read it in comparison to Hinds’s adaptation of Poe’s work, with both works coming out within months of each other. The Tell-Tale Heart (art by Virginia Nitouhei)- The first story was challenging for me, as I felt the unnamed narrator was too perfect looking (aka Manga-like). But once I got past that, the illustrations told the story very effectively. The Cask of Amontillado (art by Chagen)- The background of the festival where they two men meet and later the catacombs they enter were well drawn and really gave it a sense of atmosphere. The last page was chilling. The Raven (art by Pikomaro)- The art work in this story is gorgeous. The visions that the narrator has of his lost Lenore were heartbreaking and the last page of the raven with the grieving man was perfect. The Masque of the Red Death (art by Uka Nagao)- This ended up being my least favorite, for the story’s very essence centers around the colors of the rooms and what they represent. The lack of color affected the interpretation and it fell flat. The Fall of the House of Usher (art by Linus Liu & Man Yiu)- I have never been a fan of this story, but the illustrated version of the story elevated it to me. The crumbling estate is aptly drawn and the madness of twins Roderick and Madeline is evident. The sense of impending doom and Gothic despair shine through. This adaptation is the latest in a series of Manga classics, and I would recommend it if you enjoy Manga and already own previous classics from this collection. I would hope that readers would look at Poe’s additional works, if they enjoyed this strong version of five of his short-stories. I received the online book through NetGalley in exchange for an honest review, and the timing worked out well for me to compare both excellent adaptations of the premier horror writer’s work. And finally, just for fun, look at this video of Poe and Stephen King having a rap battle of who is the best writer. Poe for the win! Picture of Poe is from artist Cris Vector on Deviant Art. hahaha that rap battle was so funny 😂 These look amazing! Both Poe books are strong adaptations, with evocative artwork. Glad you liked the video- the rap battle series is hilarious! Oh brilliant!! hehe so true!! #EdgarAllanPoe adaptations — Graphic Novelty² @thewritealice – thewritealice MLS – Let Us Write You The World In Our Eyes.